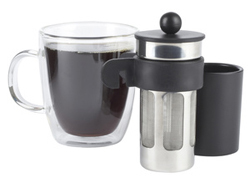 For those that absolutely must have freshly-made hot coffee, here is the Bodum Bistro Mug Press. With the inclusion of a grooved lip, it is designed to rest directly on the rim of your personal coffee mug. Fill with your favorite ground coffee, let it steep and press down when ready. The result is a cup of piping hot coffee, (almost) ready to drink. Like a French press, except on a small scale, the Mug Press is sure to create a delicious cup of coffee precisely to your liking. However, the lack of a carafe strikes me as unsettling. I don’t like running out of coffee, and I don’t know many coffee drinkers who do. I’ll stick to the French Press and the comforting thought of a refill just being a pour away. This is the most convenient thing invented since sliced bread!